No matter if you are just a beginner or a professional in the sewing world, you will need a pair of effective, quality scissors. They are an important appliance in everyone’s toolbox. And owning the proper tool for this type of hobby or job is crucial. If your scissors do not cut material and fabric as they should, you might lose time and cash on fixing mistakes. If you want to avoid that and invest in high-quality scissors, you have come to the right place. Although you might spend a few extra bucks to purchase one of the best sewing scissors, it’s worth the investment. If this is your first time buying sewing scissors, do not worry at all. We have researched the market and found the greatest sewing scissors for this year. Why Should I Invest in High-Quality Scissors? What Types of Sewing Scissors Exist? What Brand is Best? What are The Best Dressmaking Scissors? How Do I Determine Quality Sewing Scissors? What’s The Difference Between Scissors and Shears? 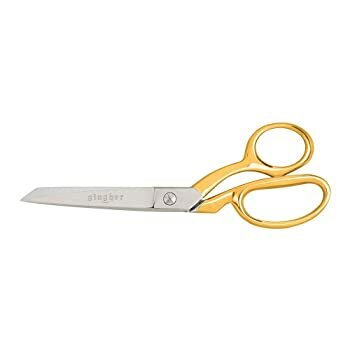 What are Small Scissors Used for in Sewing? What are The Best Pinking Scissors? How Do I Take Care of My Scissors? The answer is more than simple: Investing in high-quality scissors is like investing in your sewing. The better the scissors, the better and faster your sewing. Just imagine yourself struggling to cut through a material or fabric because your scissors refuse to cooperate. Ineffective and uncomfortable scissors represent a nightmare for every sewist. It does not matter if you are a professional or just a beginner. If your scissors do not cut through the fabric like butter, you will experience difficulties, make mistakes and get frustrated. This is why it is so important to invest in a quality pair of scissors. Also, have you thought about the fact that they will last a lifetime, unlike the cheap ones you wanted to purchase? Save yourself the time, money and frustration and invest in quality products. This does not refer to sewing scissors only but other products as well. Yes, sometimes, you will get lucky and purchase something good for cheap. However, most of the time, you will probably not. Sewing scissors represent more than just a tool when it comes to creative work. They have the power of transforming your sewing into a joyful and exciting activity. However, with so many scissors from different brands, picking the best ones can easily turn into a challenge. Choosing the best pair of sewing scissors depends on the type as well. So, before you make a purchase, ask yourself, what type do you need. If you are not familiar with the types, do not worry because we have you covered. Let’s check out the main types of sewing scissors. The name of this tool says it all. 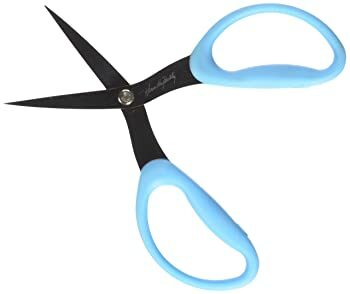 They are these scissors with extra sharp offset handles. Looking at them, you will notice that the handles seem crooked from the blades. They are formed this way to perform better when cutting through the fabric on the work surface. However, they are specially designed for fabric. And if you use them for cutting different materials, you can destroy them. If you wonder why you should invest in solid dressmaker shears, know that they will last forever since almost every fabric store offers to sharpen. And with regular sharpening, one top-quality pair of dressmaker shears can last a lifetime. So, do not hesitate to purchase this type of scissors if most of your crafts include fabric. If you are a professional sewest, you have probably heard of this type of sewing scissors. They are one of the most common cutting tools in the sewing world thanks to the sawtooth blade. The pinking shears allow you to create a nice tiny zigzag cut in the paper and fabric. They are perfect for adding a decorative notch in scrapbooking/paper crafting. However, they are mostly used to prevent the fraying of fabric edges. Also, most sewers use these shears for cutting out hemming or pattern. Same as dressmaker shears, they are made for cutting fabric. And using them for cutting different materials can reduce their sharpness. Know as office scissors, standard scissors represent the basic scissor in the magical world of sewing. Just like the name says, they are the standard type of scissors with a straight blade with matching handles. Standard scissors are made for cutting different materials. However, just like the previous two types of scissors, using them for various materials all the time might reduce their power and sharpness. Cutting the same materials is the way to keep their blades nice and sharp. Next, we have the embroidery scissors. Let’s take a look. As the name implies, embroidery scissors represent this tiny cutting tool with extra sharp tips. Meaning, they are specially designed to reach and cut those hard-to-reach and tricky places. They are ideal for snipping threads. Meaning, they also make great sewing scissors. If you were looking for smaller scissors with a curved blade which can easily slide between piles of fabric when trimming seams and cutting appliques, this is the type you have been looking for. They will make sure that you are cutting the correct layer in the exact place. Now that you know the types of sewing scissors, let’s take a look at some of the best and most trusted scissors brands on the market. Let’s review them together and find a match. We have made our research and came up with the top 3 scissor brands with a good reputation in the market. However, we will present more than just 3 types in our reviews, so you can have more options to choose from. Let’s review some of the most popular scissor brands. This is probably one of the most famous and well-respected brand on the market. And for all the right reasons. They offer a wide range of cutting tools at different prices starting from very cheap to expensive. And, they have scissors for embroidery, quilting, and sewing. Yes, most of their products might cost more than the products of other brands. However, they are worth the investment. The more expensive model you get, the better the quality. Another popular brand on the market is Gingher. They offer cutting tools with traditional style and design. They have a much more limited line that Fiskars. Meaning, the tools that they make, produce and present are specially designed for embroidery, quilting, or sewing. However, there is nothing wrong with the cutting tools they offer on the market. Just like Fiskars models, they are all worth the investment. Next, we have Kai. Let’s check them out. Kai offers cutting tools for both sewing and quilting. They have stainless steel blades and they are strengthened with vanadium. Kai’s scissors are imported from Japan. They offer two lines on the market with two different performances: the 5000 and the 7000 series. The first one represents shears and scissors with the softest ergonomic handles and some bent-handle models. And the second one offers scissors and shears for professionals and experienced sewers. It features high-quality tools with 12 inches blades and higher prices. If you are specifically interested in dressmaking scissors, keep in mind that each brand in our table has excellent models. Scroll down to find the best dressmaking scissors for you. Although the market is overflown by sewing scissors, not every pair was designed equally and will perform as you would expect. That is why we decided to review some of the most popular sewing scissors on the market and help you pick the best sewing scissors for you. First on our list of best sewing scissors is this pair of titanium scissors. 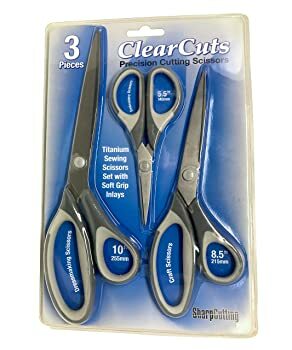 If you purchase this product, you will get 3 shears in one pack. They have precision cutting blades and will turn cutting into the joyful task. However, they are not made for fabric but paper too. What makes them one of the best craft scissors is their versatility and sharpness. You can use them for sewing and embroidery. They cut through fabric like butter. One of the best fabric cutting scissors. 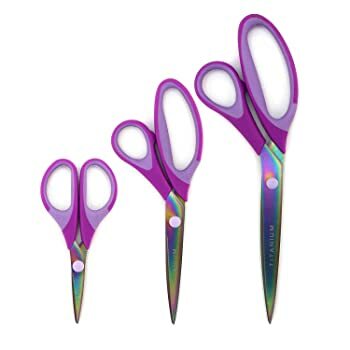 If you do not know what to buy him or her for their birthday, this set of 3 comfortable (large, medium and small) scissors is the best gift for sewers. 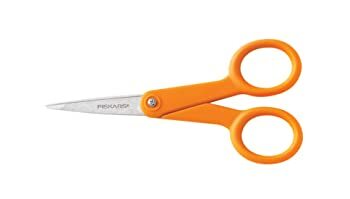 Next on our list of best scissors is the Fiskars 175800-1002 Razor-Edge SoftGrip. Ideal for cutting different materials including leather, denim and multiple layers of thick fabric. Thanks to the razor edge, they have the power to cut multiple heavier materials with ease. If you were looking for stainless steel blades that will last, this is the right model for you. And even though they have durable and hardened stainless steel blades, they are still light and very comfortable. The soft grip handle is made to reduce fatigue and provide comfort. However, the best part about this product is the lifetime warranty. One of the best pairs of scissors that are definitely worth the investment. Do not hesitate to buy one right now. Another great pick that deserves to be on this list is the Westcott 2-Pack Titanium. As the name reveals, it features titanium bonded blades. And apparently, they are even three times more powerful than steel. Also, they are corrosion resistant, which is pretty great. The ergonomic handle provides maximum comfort while working. This pair of cutting tools is one of the best on the market because it is just perfect for detail work on both fabric and paper. Also, you will get a protective cover with a lanyard for 5’’ microtip scissors. As the name reveals, this pair of scissors is designed for heavy-duty cutting projects. It has industrial strength and provides excellent performance. However, keep in mind that they feature a right-handed high carbon steel construction in case you are left-handed. According to our research, they are long-lasting. Meaning they will last for years without getting destroyed. You will receive them lightly oiled for clean and fast cutting. However, before you use them for the first time, make sure that you wipe them clean with a cloth. The rubberized ergonomic comfort grip side bent handles offer pain-free cutting. So, you will not experience pain and dullness even if you cut for extended periods of time. You can use this baby for quilting, sewing, tailoring, art projects, alternations, dressmaking, cutting patterns, and more. They cut denim, plastics, vinyl, leather, and other heavier materials. 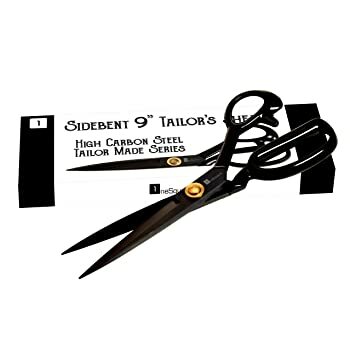 Another great choice that you should definitely consider is the Handi Stitch Professional Heavy Duty Tailor Fabric Scissors and Thread Snipes. From the name of the product, you can see what are we talking about. They are lightweight with an ergonomic design. It turns cutting into the easiest, almost effortless experience. They cut accurately and precisely. If you purchase this pair, you will always be proud of your cutting skills and your perfect cuts. They are comfortable and provide smooth cutting across any flat surface. Tailoring, sewing, altering, dresses, carpet, fabric, heavy-duty and other raw materials. You name it. They will cut through almost anything like cutting through butter. However, the best part is that you get free instructional pdf in order to get the best out of your new scissors and learn how to use them safely. If you do not like them, you can always get your money back. 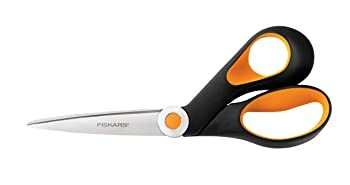 Another Fiskars model that is worth mentioning is the Gingher 01-005292 knife edge bent trimmers with gold handles. They are capable of cutting through multiple heavier materials and boosting your cutting skills. Still, their most appealing feature is the golden handles. Their bent handle design will hold your fabric flat and make sure it does not slip. They are best for trimming seams, cutting patterns or long swaths of fabrics. A very comfortable and sophisticated model that will make you fall in love at first cut. It offers pain-free and mistake-free cutting. And the best part is that you get nylon sheath for blade protection. If you were looking for the perfect sewing scissors, congratulations! You have found them. Actually, we did. However, you are free to order and convert cutting into the best activity. According to our research, they cut through fabric like it is butter. And the design is nice and very comfortable on the hand. They are sharp and will cut through almost anything. If you want something that will not cause you pain or dullness, this is the perfect pair for you. You can use them for upholstery, clothing, draperies and other projects. A high-quality product that is definitely worth the investment. And the price is more than acceptable for the quality. If you have arthritic hands, do not hesitate to buy this pair of sewing scissors. If you want durable sewing scissors with stainless steel construction, this pair is for you. They were made with high carbon steel. Meaning, they are harder, stronger and stay sharp longer than other sewing scissors you have encountered before and you will in the future. And the best part is that they will never rust thanks to the additional process they pass in the making. This tool offers effortless and smoothest cutting experience through multiple layers of fabric. You can use them for embroidery, dressmaking, upholstery, craft, sewing, tailor, household, office, student work, art, and more. Literally everything you can think of. If you are worried about the weight, do not. They are well-balanced and weighted. You will find them extremely comfortable and easy to work with. Suitable for both heavy-duty and lighter projects. They come with a 100% thrilled guarantee and matching smaller scissors. If you wonder what are the best pinking shears, this is the pair that you have been looking for. We are talking about a cutting tool with 9.3 inches total length, durable and stainless steel blades. It offers a smooth precise cutting experience. They are comfortable as well. Suitable for both domestic and professional use. This pair of pinking shears will definitely last forever thanks to the premium quality and sharp blades. Do not worry if you are left-handed. They are designed for both left-handed and right-handed users. One of the best decorative scissors for cutting photos, crafts, plastic, fabric, and other lighter materials. If you want to purchase serrated fabric scissors, this is the perfect choice for you. 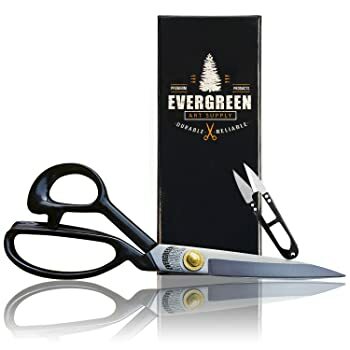 They are one of the best-serrated fabric scissors on the market with fine teeth that will hold the fabric in place and make sure that does not slip. And their blades are stainless steel. If you purchase Havel’s 30212, you will also get a blade cover for protection. A great pair of scissors that every sewist should have in their toolkit. Do not hesitate to buy it today. One more model that is worth your attention and investment is Gingher 01-005280 Stork Embroidery Scissors. They make precise snips and they are ideal for cutting thread. The gold-plated handles add sophistication. These scissors make an amazing birthday present. If you are looking for the perfect combination of beautiful design, comfort, and precision, this is it. However, they are not designed to cut heavier yarns and fabrics. 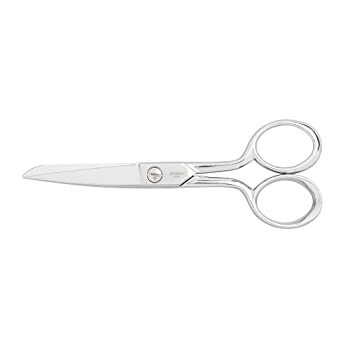 If you purchase this pair, you will be proud of your perfect cuts thanks to the precise nickel-plated blades. The best part is that you get a fitted leather sheath for storage and a limited lifetime warranty. Do not hesitate to purchase this great cutting tool before it goes out of stock. Another Gingher that you should consider is the 8-Inch Knife Edge. They stand as one of the best dressmaker’s shears on the market for a reason. They can cut through multiple layers without putting too much effort. Ideal for cutting long swaths, seams or patterns. The bent handle design will make sure that your fabric stays flat and still while working. They feature long, precision-ground, sharp blades with a double-plated chrome-over-nickel finish. They are both durable and striking. They offer mistake free and pain-free cutting. 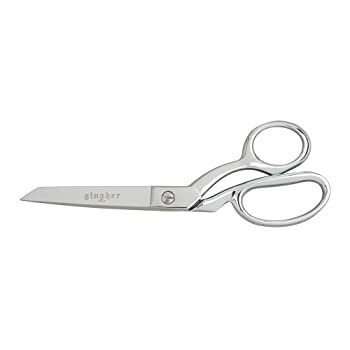 Singer did not appear in our top 3 scissor brands. 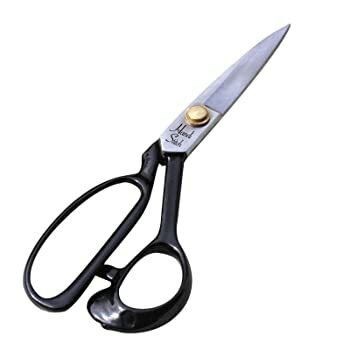 However, they still produce high-quality products such as the Singer 00561 8-1/1-Inch ProSeries Heavy-Duty Bent Scissors. They feature rubberized comfort grip handle and provide easy, comfortable cutting experience. They are perfect for crafting or sewing projects. Cutting through a few layers of fabrics is not a big deal for this great pair of sewing scissors. Blades are tampered and ground on 2 sides which results in longer life and boosted sharpness. And they passed a quality test. 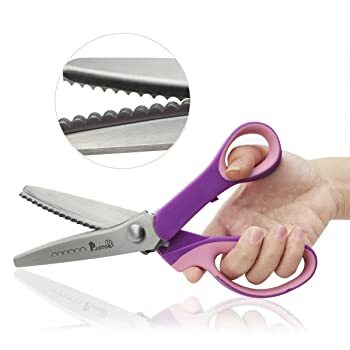 If you are searching for sewing scissors set of different sizes, BambooMN Titanium Softgrip is the perfect choice for you. It features three scissors, including 8.5-inch craft scissors, 5.5-inch embroidery scissors, and 10-inch dressmaker scissors. All quality tools. This set is ideal for photos, crafts, fabric, both professional and household use. All 3 of them feature an extremely sharp and strong blade for an easy, comfortable experience. They are stainless steel, rust-resistant, lightweight and durable. And they look stunning. Karen Kay Buckley 6-Inch Perfect Scissors are one of the few best-serrated scissors on the market. Their serrated blades will make sure that the fabric stands still and flat when cutting which results in accurate, precise cutting. They are called ‘perfect’ for a reason. Karen Kay Buckley has designed these scissors in order to satisfy all of their customer’s trimming and applique needs. They have large handles which provide comfort. And do not worry if you are left-handed. They are designed for both left handed and right handed. When using these scissors, you will notice that they pull the fabric into the blades, unlike other scissors that push the fabric away. Also, they come with a plastic cover for storage. Have you heard of Teal Professional Series – Bent Scissors? Our research says that they are one of the best sewing scissors on the market thanks to their rubberized comfort grip handle and smooth cutting experience. These babies cut through multiple layers with ease. They are just perfect for crafting and sewing project because of the sharp blades which have passed a quality test. They are tempered and ground on 2 sides to boost sharpness and extend the life of the tool. The best part is that they come with a lifetime guarantee. 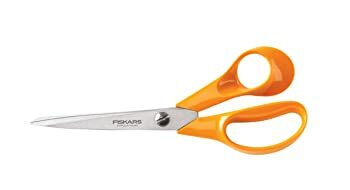 If you want to purchase scissors from Fiskars, buy this model. 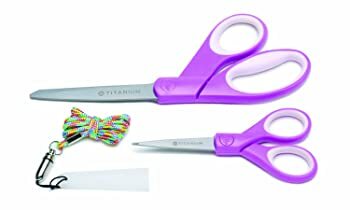 They are titanium easy action scissors made for cutting different materials including silk, denim and a bunch of layers of fabric. If you have arthritis, this is one of the best pair of scissors for you. They were awarded the Arthritis Foundation Ease-of-Use Commendation for the spring-action and easy-to-use design for people with limited hand strength or arthritis. They are approximately 10 inches long and come with a lifetime warranty, which is absolutely great. The second model by Singer on our list of best sewing scissors is the 3404. It is actually a combo pack of two scissors, one small and one large pair. The small one is 4 ¾ inch detail cutting tool. And the large one is 8 ½ inch fabric cutting tool you can use for any fabric. They both have rubberized handles which provide smooth, precise cutting experience, and comfort. The blades are stainless steel. It is a set of solid products worth the investment. Gingher Inc is capable of cutting through multiple layers of fabric, buttonholes and clip curves. The knife edge provides a smooth, easy cutting experience like no other product on the market. The blades are durable and have a double-plated chrome-over-nickel finish. If you are looking for a solid pair of sewing scissors, this is one of the best models on the market. Affordable, long-lasting and versatile. Definitely worth the time and investment. If you are looking for the best embroidery scissors, Gingher Inc Classic should work out for you. They are perfect for cutting thread, fabric and needlework yarn. However, the best part is that they come with a leather sheath for blade protection. One of the best embroidery scissors on the market. A great deal for the price and worth the investment. Finally, let’s review some of Kai’s products starting with their 7250 10-Inch Professional Shears with high-carbon stainless steel blades. They offer superior cutting on different fabrics. Meaning, they are suitable for both heavy-duty and lighter cutting assignments. Once you get your hands on these babies, you will notice that they have excellent balance. Also, they offer smooth cutting experience. There is not much to say about this brand and its tools. Kai is one of the most trusted brands on the market and for all the good reasons. Going back to Fiskars, we have one more model to present and review. It is the 01-005437 Heritage Seamstress Scissors. They are perfect for cutting different materials, including silk, denim and multiple layers of fabric. The proprietary blade grinding technique provides a durable sharp edge that works all the way to the tip. It comes with a lifetime warranty. 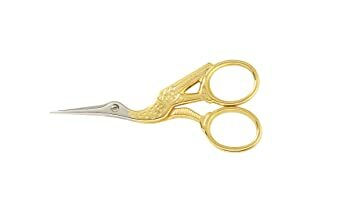 It is rust resistant pair of solid sewing scissors that will certainly impress you at first use. Another model by Singer we reviewed is the 00564 ProSeries Thread Snips. They have rubberized comfort grip handle which provides comfortable and smooth cutting action. However, the best part about this tool is the lifetime guarantee and the fine tip blades. They have passed a quality test and perform precise cuts every time. A great pair of nice and solid thread snips worth the investment. You can easily snip away unwanted threads with these babies. One of the greatest 5-inch thread snipes that are worth your money. If you are a professional who’s got a constant flow of heavy-duty work which includes thick fabric, the Gingher G-TNKE Knife Edge Thread Nippers might be of great use to you. They can be used for snipping thread, heavier yarn, and of course, thick fabric. They feature a knife-edge blade and specialized handle improve control. You can use them in needle arts, sewing crafts and much more. They are made of double-plated chrome and are hot forged. We are finishing this list with two more products by Fiskars since they stand as the most popular and trusted brands on the market. First is the Micro-Tip Scissors. They come in orange and make the perfect scissors for cutting tight patterns, cutting at awkward, tight places and angles and fixing details on different types of fabrics. 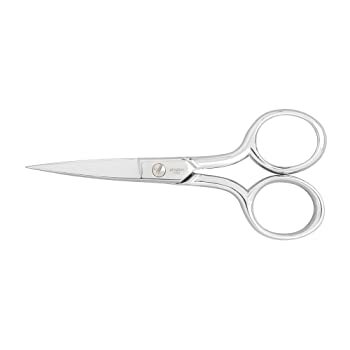 Thanks to the Micro-tip and stainless steel blades, these scissors offer a precise and smooth cutting experience. 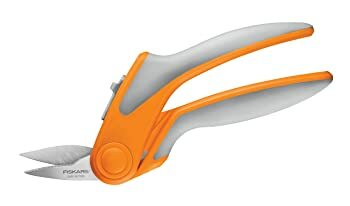 Last but certainly not the least is the Fiskars Softouch Spring Action Rag Quilter Snip. Ideal for cutting through different types of materials including silk, denim and a bunch of layers of fabric. You would be surprised how smoothly it cuts through different materials. The spring-action design reduced hand strain and short blades make quick snips easy while the serrated edge grips hard-to-cut materials. Perfect for people with arthritis and weak hands. It was awarded the Arthritis Foundation Ease-of-Use Commendation for a design. Always look for cutting tools with stainless steel blades. Why? Well, because they offer a powerful and durable edge life and cut through almost any material without much effort. Also, keep in mind that you should be able to maintain and sharpen your cutting tools. So, always pick the product with a lifetime guarantee. If you doubt between plastic and metal handles, know that plastic is more comfortable to use. Also, they are lighter than metal. However, owning heavier scissors has its benefits too. For instance, when you want to cut through layers of fabric, heavier scissors might come in hand. Still, most plastic and metal models are made to fit the contours of your hand. Always look for ergonomic and rounded. Also, pay attention to the quality of the blade. Blades made with high-grade materials and production methods result in a precise cut. If you suffer from arthritis and have weaker hands, always choose lightweight cutting tools made of titanium which is lighter than steel. If you are a beginner, you probably want to know what is the difference between sewing scissors and shears. Shears are heavier and they are made for heavy-duty cutting tasks. Their handles have one ring larger than the other which enables a few fingers to slide into it, which provides greater control over cutting. Shears come in various sizes. The longest reach around 12 inches. However, you should pick the size according to your preferences. If you have smaller hands, you will find shears with shorter blades a bit more comfortable. And you do not have to worry if you are left-handed. Most shears are made for both left and right-handed users. There is one type of shears called ‘serrated-edge shears’. They offer greater control over cutting synthetic fabrics and other materials that tend to slip. Sewing scissors, on the other hand, feature one blunt tip and one pointed tip. Also, they are not longer than 6 inches. Meaning, they are lighter. And they have equal rings on the handles. Sewing scissors are designed for small cutting tasks like close work or snipping. The time comes when you need the assistance of a smaller pair of scissors. However, if you are a newbie, you must wonder why. 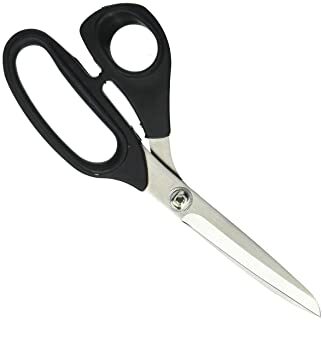 What are small scissors used for in the sewing world? Often referred to as tailor’s scissors, smaller scissors weigh less and have short blades. These features make them ideal for smaller cutting tasks and craft projects like quilting. However, never underestimate the power of smaller things, especially small scissors. Even though they are smaller than other scissors, they are still strong and worth the cash. Pros know that a solid pair cuts through fabric like butter. And they are worth the investment. Also, they can easily fit into your sewing bag. Embroidery scissors are delicate and small too. At first sight, they appear as something you would find on a surgeon’s table. However, they are excellent for creating tiny snips when required thanks to the very pointy blades. Besides for embroidery projects, you can use embroidery scissors in hand sewing. Just tie them onto a ribbon and hang them around your neck for easier access when you need them. You have probably noticed one more pair of small scissors in craft stores. They are known as general craft scissors and appears as the standard scissors, which they are, technically. However, their price is very low unlike the price of the scissors we presented and talked about in this article. And they will die faster, project by project which is fine, considering the price. Destroying them will not make you feel guilty like you would with other scissors. If you are specifically interested in pinking scissors, we have mentioned a few quality pairs in the comparison chart above. 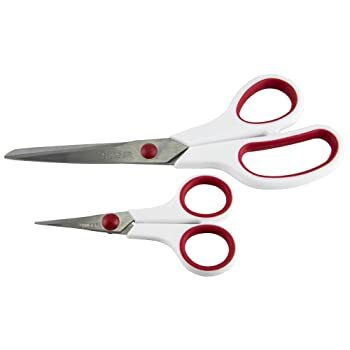 Check them out and pick the best pinking scissors according to your needs and budget. They are not made the same but they all have a common feature. The pink design! Did you know that pinking shears were the ‘thing’ before sergers came? If you are a long-time sewest, you probably know that they were the best tool to finish seams and prevent edges from fraying a lot. And they were used for clipping and trimming curves. When buying a pair of pinking scissors, pay attention to the weight, edge, length, need, and brand. Buy from trusted brands like the ones we have mentioned in the comparison chart. Now that you know everything about sewing scissors, let’s learn how to take care of them. Just like with any other tool, if you take proper care of it, it will last longer and perform better. Sewing scissors are not an exception and this is how you should take care of them. Do not use your sewing scissors for cutting tissue sewing patterns and all sorts of materials. They are called ‘sewing scissors’ for a reason. Cutting paper can dull the blades. Also, pay close attention to pins. Make sure you do NOT cut through them. Store your sewing scissors in a sewing kit or in a case away from your family. Make sure that they are out of reach and not used frequently in order to avoid damage. Sharpen your sewing scissors occasionally. However, do not do it yourself or ask a friend, family member or someone who is not specialized to do it for you. Visit pros to get professional results. Your dad does not know the best sharpening techniques. Lubricating and cleaning your sewing scissors occasionally will keep them pleased. We sincerely hope that you find this guide helpful. We have shared our honest opinion on the best products on the market. It is up to you to decide which one you want to invest in. However, do not forget to take into consideration our most affordable pick, the editor’s choice and the best sewing scissors for beginners, if you are new to the magical world of sewing. Feel free to share this guide and follow us on social media for the latest reviews.